It’s mid-December and I’m feeling festive. So let’s start things off with a little holiday music…. Seriously, though, they do want free shipping. In fact, comScore reports that over half of all eCommerce transactions this holiday season have included free shipping. As an online seller, yes, free shipping kinda stinks. You’re forced to either make up the cost elsewhere, or you simply lose margin. But here’s something perhaps you didn’t know…. Free shipping brings about bigger transactions. In that same comScore report, it shows that the average order value is often significantly greater when free shipping is offered, compared to when consumers have to pay for it. So that may add a little extra cheer to your bottom line. But while baskets are often bigger with free shipping, ultimately it can still hurt your profits. So with Free Shipping Day right around the corner, let’s talk about some different offers that may be a little more feasible for your business. 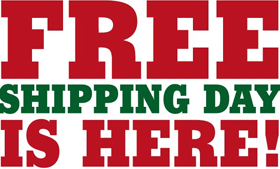 Free Shipping Day is coming up this Monday, and it’s expected to be huge. It’s one of the last days that buyers can shop online and receive their orders before Christmas, and it’s a day that many merchants take their free or discounted shipping offers to a higher level. When you actually examine the shipping offers from the 1,400+ merchants participating in Free Shipping Day, you’ll notice something: many don’t really offer free shipping, at least not without some type of stipulation. So let’s dive into 5 common types of “free shipping” offers from online retailers, those that have various strings attached. It’s a common practice for online sellers to include a minimum threshold with their free shipping offers. For example, buyers only get free shipping if their baskets are over $50, as you can see here with one of the offers from Kohl’s. This type of offer often results in higher average order values. And while merchants can still technically advertise free shipping, it helps to mitigate the risk for those sellers. Online sellers typically have higher margins on some products than others. They also have some products that sell better than others, or those with a shorter shelf life, making it more practical to offer free shipping on those types of items. Here you can see that REI is offering free shipping on their Lego Lights and Headlamps. And here you’ll see an offer from Under Armour in which they offer free shipping on their Gift of the Day. With these types of offers, sellers are able to more easily move the merchandise they want to move, while excluding free shipping on items that can get them into trouble. As you can see here from Nike, they’re going with a stepped up approach to number 2 above, which is that they’re offering free shipping on most orders. To get the free shipping, shoppers must purchase from Nike.com or Swoosh.com, they must enter the promo code, and the offer doesn’t apply to NIKEiD orders. Free shipping on “most orders” sounds better than on “certain orders,” and it still provides merchants with the ability to exclude low margin items, or other types of products from the offer. It’s nice to reward your loyal customers. And it’s also a way to generate sales from a free shipping offer without going broke. Here we can see that Cabela’s is offering free shipping with the Cabela’s Club Visa Card, generally held by frequent buyers. In this case, Cabela’s is also encouraging the use of their credit card, a common way retailers bring in additional revenue through interest. I’d prefer to see a different type of loyalty program without the credit, but hey, it’s an option. This isn’t exactly free shipping, but another fairly common offer is reduced flat-rate shipping. Here we can see such an offer from Converse, which states that all orders ship at a flat rate of $5.95. This type of offer is not only easy to understand, it’s often easier for merchants to administrate, and yet still allows sellers to get noticed among buyers without completely killing their margins. eCommerce selling can be a tough world. Competition is fierce and consumers expect great deals. And while it’s not the only deal they expect at this time of the year, free shipping has shown to be one of the most significant. As a merchant, just remember that you have options, and that a little creativity can go a long way.